« Mmmmmm….Braised Beef Short Ribs…one of our faves! Chicken Breast Stuffed with Prosciutto and Gruyere Cheese ~ Fantastic! We love this recipe from www.chow.com! 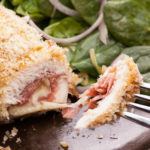 In a typical chicken cordon bleu recipe, ham and Swiss cheese are rolled up inside a chicken breast and fried until crispy. In this version, we use salty prosciutto and nutty Gruyère cheese, and for extra flavor we coat the chicken with Dijon mustard and panko breadcrumbs. Then the whole thing’s baked until the outside is crispy and the cheese inside is oozy. Serve this rich and savory chicken dinner with a tangy salad. Heat the oven to 375°F and arrange a rack in the middle. Line a baking sheet with aluminum foil and set it aside. Place the panko and 1 tablespoon of the oil in a shallow dish, season with salt and pepper, and use your hands to combine evenly. Place the Dijon and the remaining 4 teaspoons of oil in another shallow dish and whisk to combine. Set both dishes aside. Cut each chicken breast in half horizontally. Place 1 chicken piece on a work surface, cover with plastic wrap, and pound to an even 1/4-inch thickness with a meat mallet, a rolling pin, or the bottom of a pan; transfer to a large plate. Repeat with the remaining pieces of chicken. Lay the chicken on a cutting board and season both sides with salt and pepper. Arrange the pieces so the narrowest ends face you. Place 1 piece of prosciutto on top of a piece of chicken vertically, and a second piece perpendicular, making a cross pattern. Center a quarter of the cheese over the prosciutto horizontally.Fold both pieces of prosciutto over the cheese to completely cover and enclose it.Fold the bottom of the chicken up over the cheese-and-prosciutto bundle to enclose it, then roll tightly into a cylinder.Use 2 toothpicks to secure the roll; set aside. Repeat with the remaining chicken, prosciutto, and cheese. Dip 1 chicken piece in the Dijon mixture and roll to coat it in a thin, even layer. Then place it in the panko, roll to coat, and press the breadcrumbs onto the chicken to adhere. Place the breaded chicken on the prepared baking sheet and repeat with the remaining chicken cylinders, spacing them evenly on the sheet. Bake until the cheese is melted and the chicken is cooked all the way through, about 45 minutes. Remove the toothpicks and serve immediately.